Iceland has written down the laws for drone pilots in great detail. In this article, we explain the current legal situation for drone pilots in Iceland. Maximum flight altitude: In Iceland, the maximum flight altitude is limited to 120 meters above ground. If your copter supports a height limit, must set it to 120 meters. Maximum horizontal distance and FPV: You may operate your drone only within the visual line of sight. Compulsory insurance: The Icelandic transport agency is of the opinion that all copters should be insured. Even if the insurance coverage is only legally prescribed from 20 kg of take-off mass, you should secure yourself. Maximum take-off weight (MTOW): Within urban areas, the maximum take-off weight may not exceed 3 kilograms. Outside cities and villages, flights are allowed of up to a take-off weight of 25 kilograms. Distance to airports: To Icelandic airports with scheduled flights services (Keflavík, Akureyri, Reykjavík, and Egilsstaðir), your copter has to keep a distance of at least 2 kilometers. For all other airfields, there is a prohibition zone within a radius of 1,5 kilometers. If you want to get closer to these airports, you need permission from the control tower. However, the permit does not have to be collected if you do not fly higher than the highest elevation in the immediate vicinity. Other safe distances: For freestanding buildings, a distance of 150 meters must be maintained. Within settlements, a minimum distance of 50 meters to buildings must be ensured. If you want to get closer to the buildings, you will need the consent of the residents/owners. Flight bans: Multicopters must not be operated in breeding areas (for example bird rocks), over gatherings of people, over houses, over vehicles and deployments of safety organizations (such as police, fire brigade, etc.). Flight approval: In national parks, you need written authorization from the park administration before the flight (for example, there is an application form for the Vatnajökull National Park). Specific regulations: Before you start with your copter in Iceland, you have to attach your name, address and telephone number on the drone. Regulations for commercial pilots: As soon as your drone in Iceland is not used exclusively for recreational activities, you must register with the Samgöngustofa. Registration is also necessary if you want to publish your private recordings (for example, on social media). 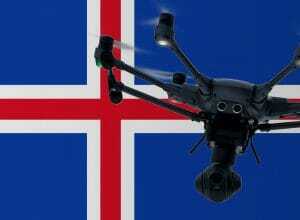 We have researched the listed drone regulations for Iceland to the best of our knowledge. We can not guarantee the correctness of the information. If you want to be on the safe side, please contact the competent aviation authority. Alternatively, you can also ask the embassy in your country for further information about the regulations. Please leave us a comment when you receive news or gain experience with your copter in Iceland!